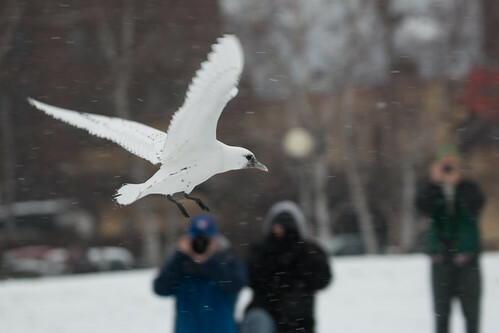 On Saturday, January 23, the Ivory Gull that had been delighting birders and tourists in Duluth’s Canal Park since New Years Day appeared to be in serious distress. Wildwoods, our wonderful and professional bird rehabilitation organization, was called in late Sunday, and some people did try to capture the gull, but it eluded them. It hasn’t been seen since nightfall on Sunday. It’s sad that the bird died, and also bewildering. 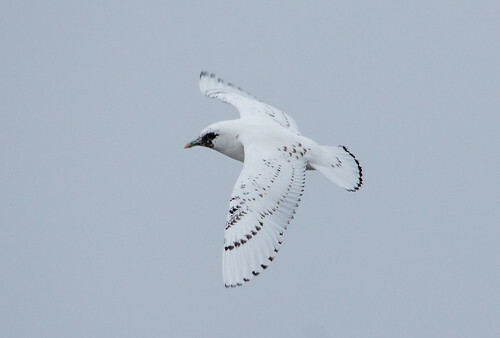 Ivory Gull individuals do appear now and then in the Lower 48, but it’s rare enough that when one appeared last year in southern Illinois, birders from all over America made the journey to see it. 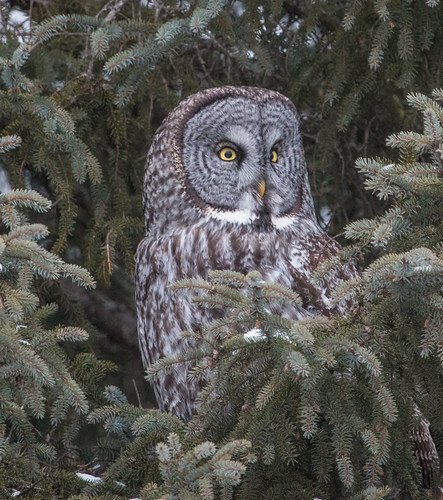 The American Birding Association’s Facebook page kept birders up to date on the Duluth bird’s appearances, and again, many people made the trek to Duluth to see it. No one knows why individuals of some species wander occasionally. Ivory Gulls have long been known to be subject to this periodic wandering, but whether the individual vagrants leave their natural range because they’re in some distress or for another reason is beyond our ken. 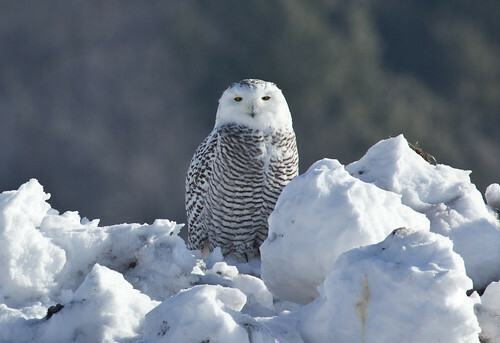 Thanks to the scientists putting transmitters on Snowy Owls in Project SNOWstorm, we’re in the beginning stages of teasing out some of the mysteries involved in that species’ winter movements. That work, in combination with the many insights raptor rehabilitators bring to the table in handling an even larger number of individuals during some Snowy Owl invasion cycles, is getting answers to some of our questions, even as it’s inspiring even more questions. 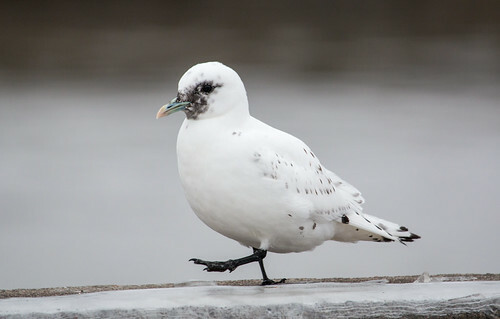 Unfortunately, a Project SNOWstorm approach would be impossible with Ivory Gulls because it’s so rare and unpredictable that an individual Ivory Gull moves south, and when one does, it usually remains only a day or two, making it unlikely that a bander involved in an Ivory Gull project could even get on the scene while the bird is still present. And then, even if an experienced Ivory Gull bander were present, banders haven’t developed as many straightforward protocols to trap gulls in winter—most research projects on gulls are done on their breeding grounds. Because no one captured it, we’ll never know why the Duluth Ivory Gull was in distress. One Ivory Gull that drew hundreds of birders to West Point Lake in Georgia in 2010 died of aspergillosis—a common and widespread fungal infection of the lungs. Did that bird leave its natural range because it was already infected, or because it already had a compromised immunity that made it more vulnerable than Ivory Gulls that stay in the Arctic? We may never know the answer to that. 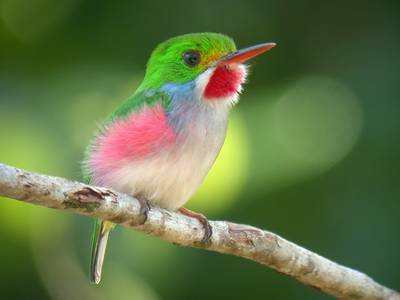 In the case of such exceptional birds, every single data point is invaluable. 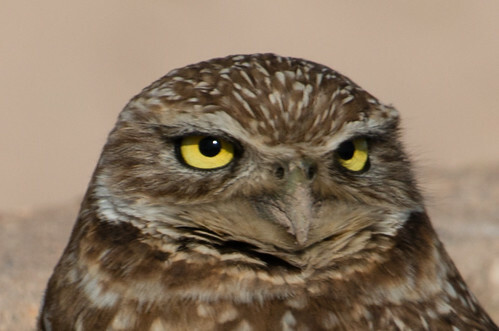 But most birds in distress die either directly from predators or at nighttime, making it very unlikely that their carcasses can be retrieved for necropsy. The mangled Ivory Gull carcass I retrieved in Superior on January 6 was too far gone to provide any information about the bird’s physical condition before death. 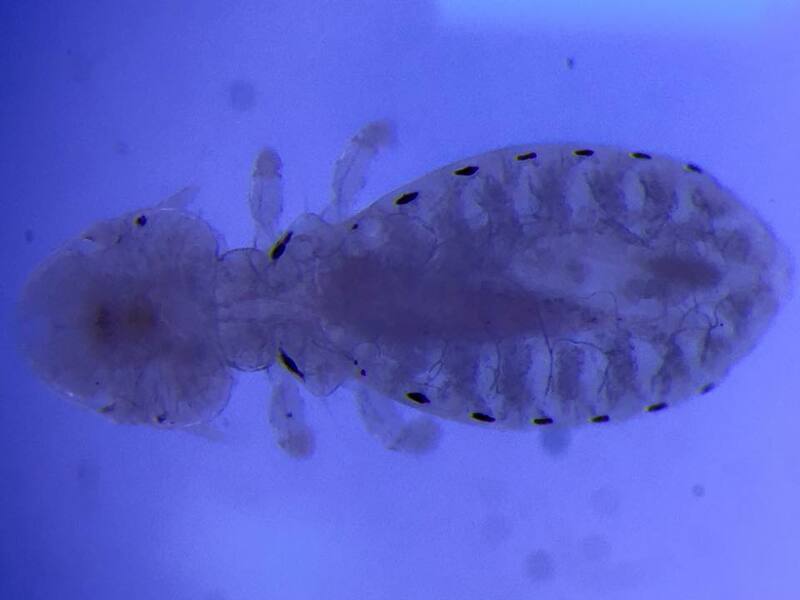 Scientists at the Field Museum have retrieved both a louse and a mite from it--critters that were as dead and frozen as the gull. These permanent parasites live their entire life cycle on their host, and identifying them reveals important information to scientists in disciplines from taxonomy to animal behavior. So even limited amounts of salvageable body parts can contribute to our knowledge of various species. Retrieving and providing professional rehabilitation for out of range birds if they are clearly sick or injured seems to me a wise course, both out of compassion for the bird, just in case it can be rehabilitated for release, and to augment the woefully tiny body of information we have about these birds. Our lack of physical data about Duluth's otherwise wonderfully well documented Ivory Gull lends its already sad death an additional layer of tragedy. Yesterday I was walking and observed 3 northern ravens on the ground. They are around all of the time flying about and scavenging. I noticed that one of them was being pushed sideways by another. Then I noticed the one being pushed, while it appeared to be a mature bird its legs were noticeably shorter compared t the other ravens. It could move on the ground but seemed to have great difficulty compared to the others. The closer I looked it became apparent to me that the bird had some type of birth defect or injury causing both legs to be grossly misshapen and it appeared that the left foot was basically held in a knot. I could not get a good view of the right but the bird seemed to use that one to "shuffle" and put most of its weight on. Then the one of the most amazing things I have ever witnessed in nature occurred. 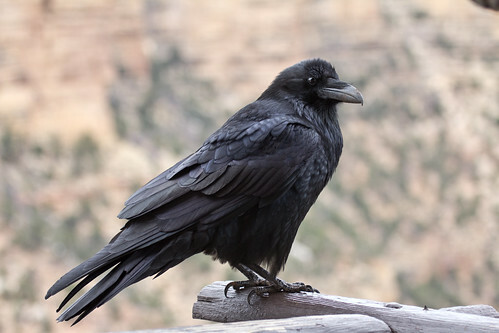 On three separate occasions, the bird that had been pushing or what appeared to be assisting the "crippled" raven moved off a short distance, picked up something with its beak, moved back to the handicapped bird, and placed it on the ground. Then the crippled bird reached down with its beak, and picked up and ate whatever the first bird had brought to it. I observed this three times in a relatively short period of time. The second bird, based on what I observed, appeared to be feeding the other raven. Helping it. I have seen this behavior in canines regurgitating food brought back to the pups but never heard of it among ravens. That handicapped bird appeared to be mature and otherwise healthy. 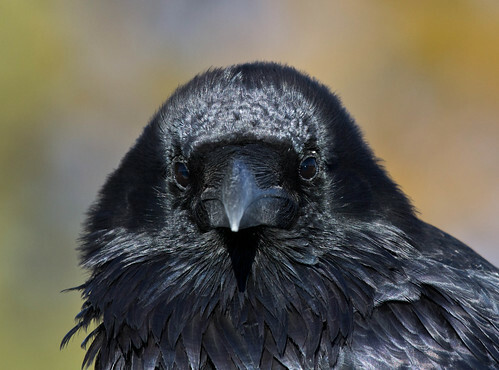 Wondering if you are aware of any thing in the literature of ravens helping one another. 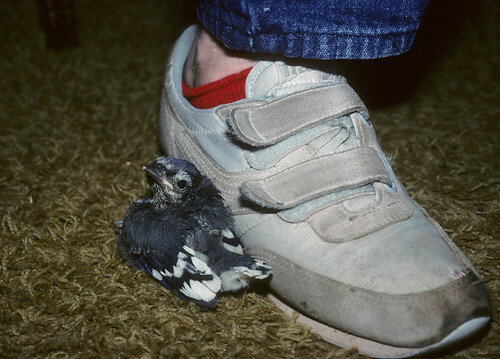 Sneakers got her name as a fledgling because she liked to snuggle against our shoes. I don't have photos of B.J. BJ came to me in the first place one December after a major blizzard and frigid weather. Someone found him on the ground beneath their feeder, and easily picked him up to bring to me. It turned out that BJ had a congenital deformity and simply could not open his wings at all. Because of that, or as the root cause of it, his pectoral muscles were almost non-existent—beneath the chest, I could feel the almost bare keel bone. He was near starvation when I got him. As he recovered, he was great at hopping and jumping, and outdoors could easily get from tree to tree if there were low branches or a nearby shrub. I presume his parents stuck with him from the time he hatched in early summer until winter became too pressing for them and they finally had to move on without him. 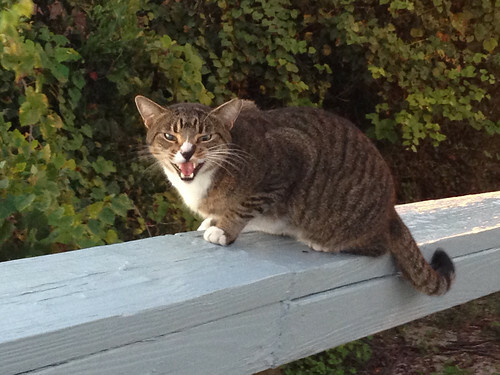 I like thinking that they intentionally left him near a feeding station so he’d at least not starve. Kevin McGowan of the Cornell Lab of Ornithology has been keeping track of individual crows in the Ithaca, New York area since the 70s. When West Nile Virus hit, it decimated the crow population. 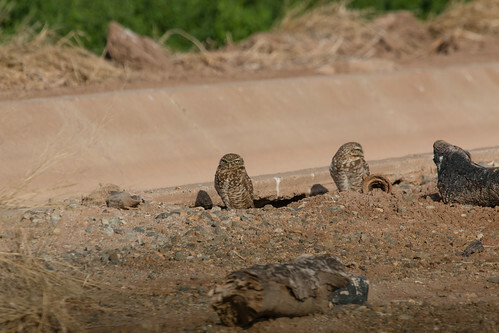 Kevin discovered one male and chicks dead, and both parents in an adjoining territory. The surviving female went to her neighbors and raised their young. The following year, at least one of those chicks helped her raise her next family. We love to pretend our species has a monopoly on intelligence, compassion, love, and empathy. But if we were indeed as smart as we think, we might pay a bit more attention to the intelligent and even compassionate living beings all around us. Thanks, Mike, for this lovely reminder. 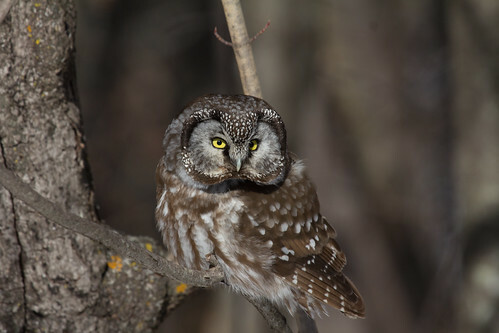 This winter lots of amazing birds have been turning up here in the northland. 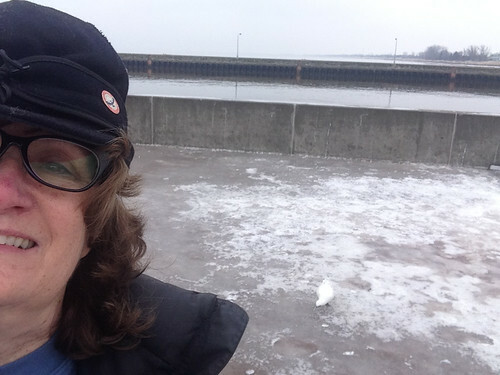 We started out 2016 with a New Years Day Ivory Gull in Canal Park. That one stuck around for a nine days. We don’t know what happened to it—the cold front that sent it packing also sent most of the waterfowl and other gulls away. 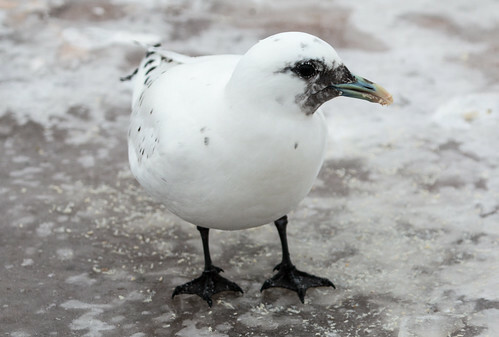 On January 12, Bill Tefft reported an immature Ivory Gull being mobbed in an Ely backyard. That one was on the ground and seemed traumatized by mobbing ravens. 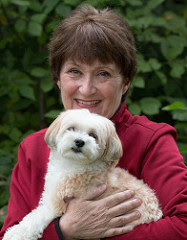 Bill said that Muff Shumacher and her neighbor took it to the vet clinic for examination and subsequent consultation with the local wildlife rehabilitator. As soon as it had recovered, it flew away. We don’t know if it was the same individual that had been in Duluth, but there’s at least some chance that it was. 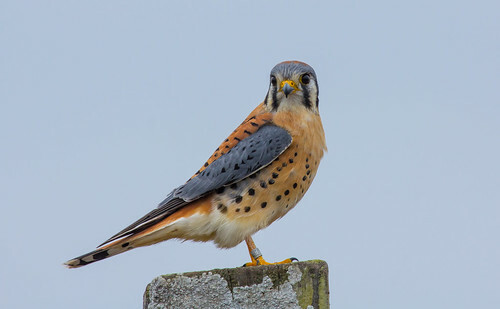 Birders who surged into Duluth to see the Ivory Gull also headed to the Superior harbor to see a gray Gyrfalcon that has been hanging out by a grain elevator for the past few years. This year a young female is there, too. Disturbingly, many of the acquisitive birders haven’t been satisfied with the fine looks available from the road, and have been driving into work areas that are clearly marked no trespassing. Their bad behavior jeopardizes access for all of us. 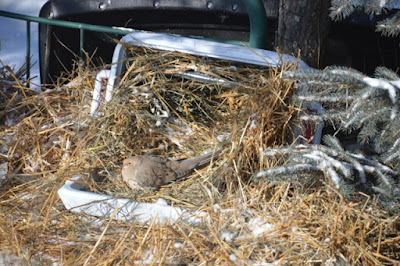 My friend Kathleen Preece has been hosting a Mourning Dove near Bemidji this winter. Most doves wisely fly the coop—their bodies are hardy enough to endure if they have enough food, but their fleshy feet are prone to frostbite if they can’t spend most of the day roosting with their tummy keeping their toes warm. Kathleen has been providing sunflower seeds, millet, and mealworms, and the dove seems content, especially after Kathleen constructed a little shelter for it. I’ve had a few reports of individual robins here and there, visiting feeders. 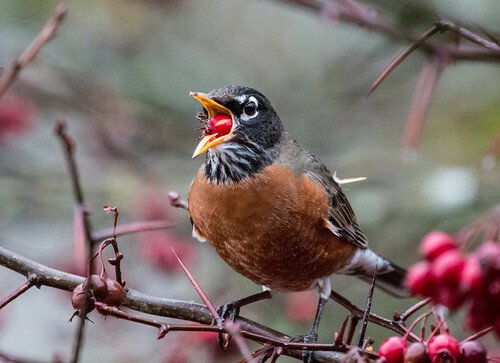 We always have at least a few robins through at least January up here, usually in small flocks or mingling with Bohemian Waxwings, found mostly at crabapples and mountain ash. 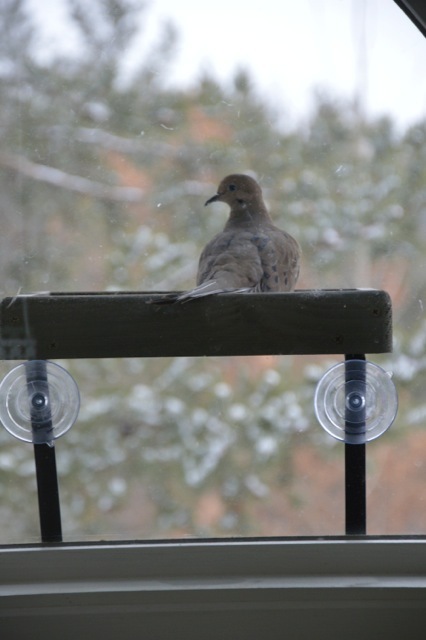 Some of them observe other birds at feeders and check it out. We can help them by providing frozen berries (no need to thaw them—they say easier to eat when they were purchased frozen) or mealworms. People don’t normally feed robins, so they don’t have a normal search pattern for bird feeders. Many never do figure them out, but some do. 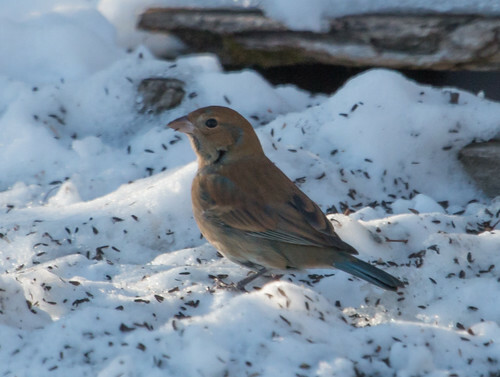 The Indigo Bunting that doesn’t belong anywhere near here was still around at least through Sunday the 10th. I don’t know if it can survive the winter here, but it did at least survive the first bitter cold night. Indigo Buntings aren’t as flexible in their migratory movements as robins and waxwings, so I don’t know if this little guy will be able to head south or not. 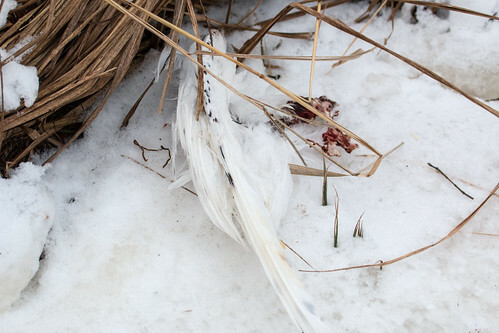 In other news, the Ivory Gull that was found dead in Superior two weeks ago is still dead. When I was looking at my lifer Kirtland's Warbler on June 6, 1976, there was no such thing as a home computer, much less eBird! 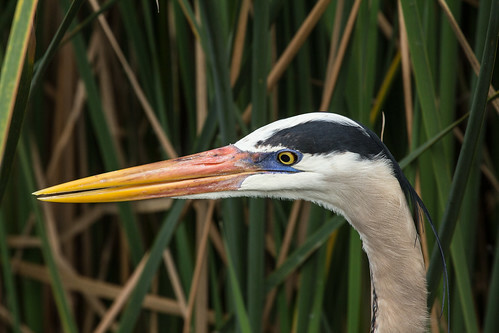 Way back in 2002, the Cornell Lab of Ornithology and Audubon launched a wonderful and completely free web-based bird-listing program called eBird. When we enter the birds we see, eBird keeps track of our lifelist and our lists for every country, state, and birding location—even our backyard. 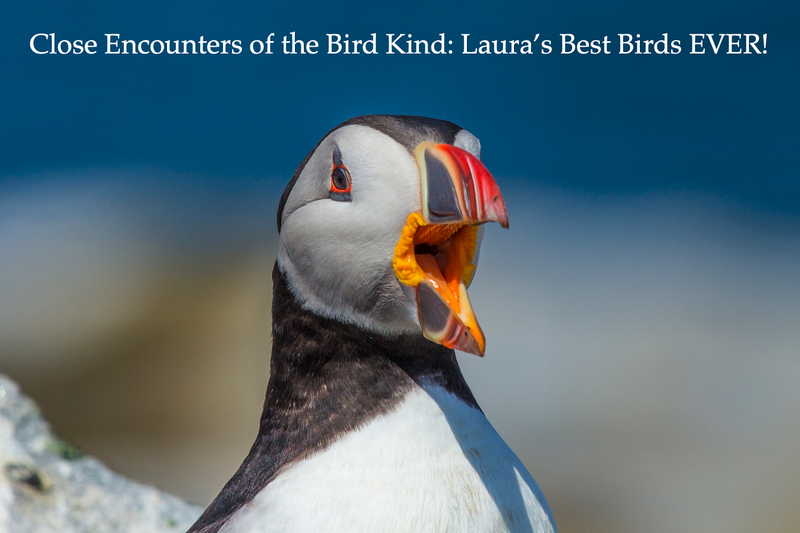 Not only does this help us keep track for ourselves—it provides valuable data for ornithologists and other birders. Unfortunately for lackadaisical people like me, eBird’s greatest value for everyone requires us to keep track of the numbers of each species that we see in each location. On a given day of birding, one can easily tally birds in 10 or more locations. For the Sax-Zim Bog alone, eBird lists 78 different locations, and anyone who has actually tried counting chickadees knows it isn’t all that easy, so contributing to eBird can be unwieldy when we just want to chill out looking at birds. And if we forget to jot down where we saw each Gray Jay and Black-capped Chickadee, so just enter it in the Sax-Zim Bog location in general, or St. Louis County, our eBird checklist for the day will be far less valuable for bird population, distribution, and conservation work by scientists. 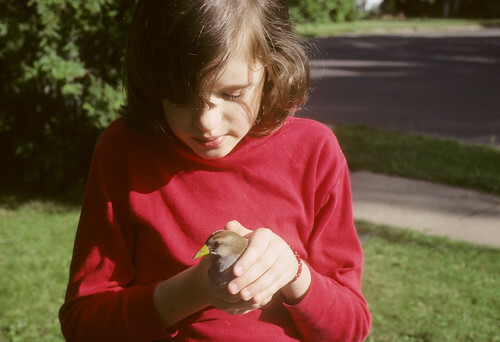 When it was originally launched, eBird data had to be entered into the computer after we got home, which required birders to maintain a field notebook. 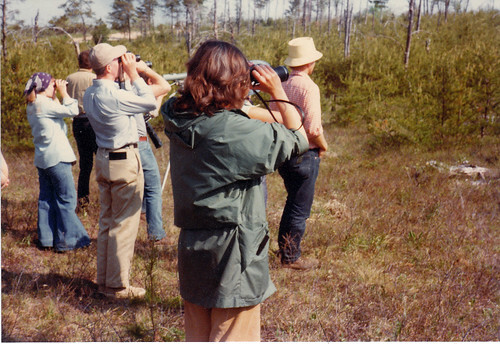 I took two ornithology classes during my first couple of years of birding in the 70s, which got me into very good habits as far as keeping a field notebook and keeping track of individuals, but I fell out of those habits long before eBird started. It took a serious adjustment in my mindset to start keeping track of numbers and precise locations again, and even now I’m not nearly as disciplined about this as I used to be—my 2016 New Years resolution is to be far more dedicated to using eBird in the way it was intended. Fortunately, the more I use eBird, the easier that gets, especially because the eBird team developed and keeps improving a great eBird app for both iPhones and android. Now the moment I arrive at any birding spot, I open the app and press the big start button. If I select “Choose a nearby hotspot,” it uses my phone’s GPS to find the closest spot to me. It also knows what time it is. After I choose my location , all I have to do is tap the space in front of any species I see--each time I tap, it adds 1. And if I count 224 Sandhill Cranes, I can touch the species and simply enter the number. When I’m done, I press Review & Submit, it asks a couple of easy questions, and I’m done. This year I intend to keep my eBird lists up to date every time I’m out, and from home on days when I keep track of my backyard birds. 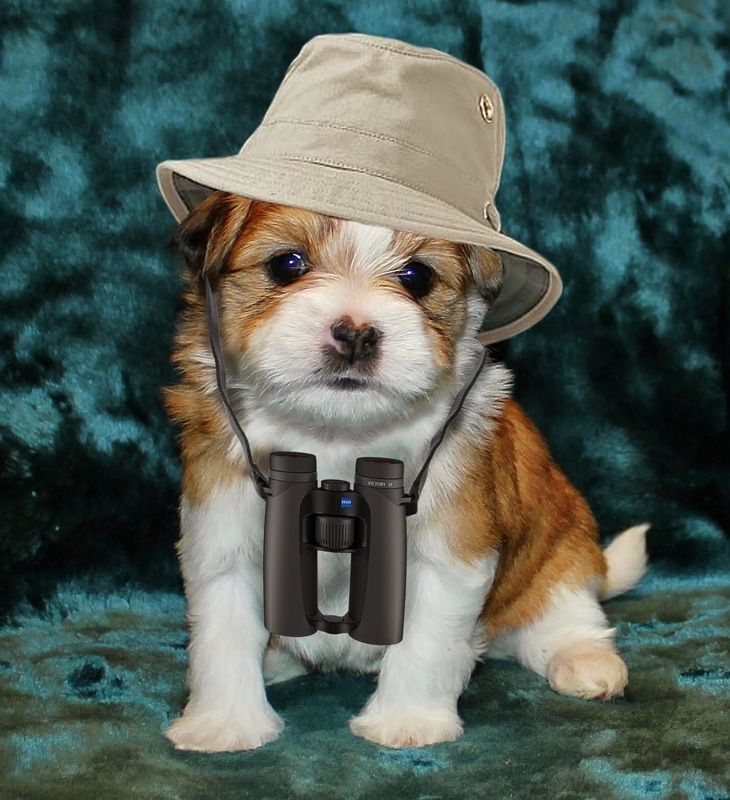 I didn’t quite have the hang of eBirding during my Big Year in 2013, so I wasted a lot of opportunities. 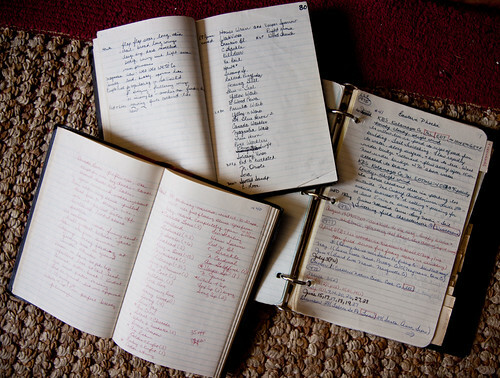 I did write down most species in field notebooks or checklists, and over the years kept most of my records in a great but now outdated program called Avisys. Little by little I’m entering that old data into eBird. 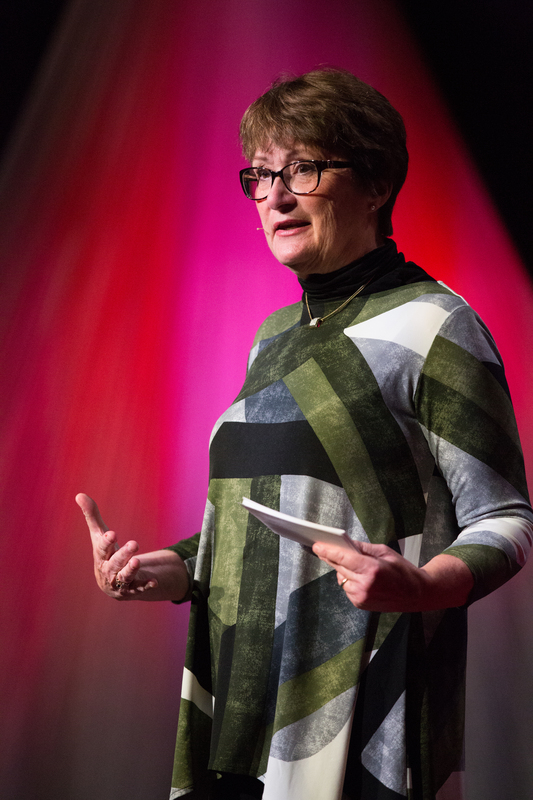 I don’t have most of those locations down to individual spots—often not even the county. And I have virtually no numbers for species on my lists, at least not since I’ve been able to go on exotic birding tours. Fortunately, eBird allows me to enter “historical” data with far less precision—doing that is not nearly as valuable information for research, but the eBird team created this system as a service to birders like me. I usually work on entering my old data while watching TV with my mother-in-law in the evenings. At this rate, it’ll take years to enter everything, but meanwhile, I’ve made sure my Minnesota list at least shows the number of species I’ve seen in the state. I’m leaving for a California birding trip on Saturday, so I got that list up to date so I’ll know what birds are new for the state. 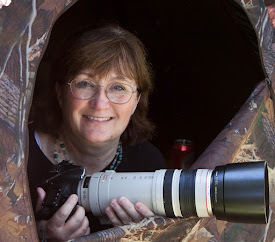 My next goal is to get my lifelist up to date, which will involve adding birds I’ve seen in Mexico, Guatemala, Costa Rica, Ecuador, and Germany. 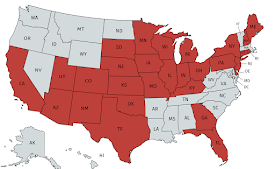 Then I’ll get the rest of the states up to date, starting with Wisconsin. But meanwhile, even as I go backwards in time in the evenings, I’ll be keeping my day-to-day checklists entered more precisely on the app. 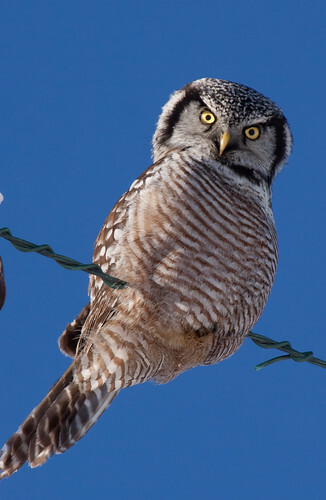 EBird is a great program with enormous value for conservation and research about birds, and it’s free. 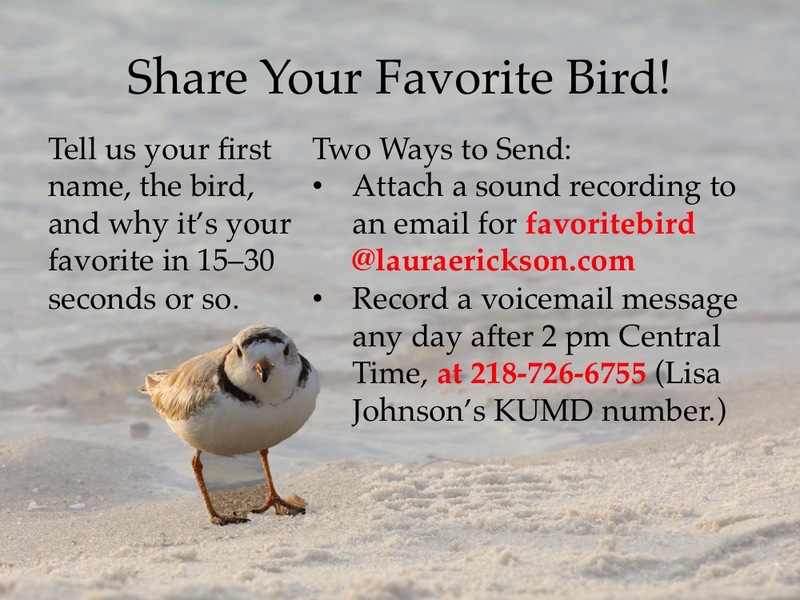 Anyone who wants to keep track of birds should try it out! Head to ebird.org and get started now!